YouTube, the world's largest digital repository of streaming media, will launch a subscription music service later this year. The service has its own negotiating team and operating unit, but will likely have some overlap with new features also rumored to be coming to Google's Android music platform, Google Play. The two new services are defined by their respective places in the Google (GOOG) empire: Google Play for Android is a digital locker for music—users buy, store, and sort a collection of tracks; but on YouTube's coming service, anyone can listen to tracks for free. Both services are said to be adding a subscription fee that will unlock additional features. For the YouTube-based service, this will likely mean ad-free access. Fortune was briefed on the service by sources in the record industry and at Google who declined to be named. Through a spokesperson, YouTube issued the following statement: "While we don't comment on rumor or speculation, there are some content creators that think they would benefit from a subscription revenue stream in addition to ads, so we're looking at that." 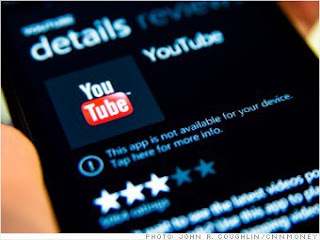 YouTube is already one of the most heavily used music services in the world, but it hasn't yet charged users. Instead, it sells ads against its music videos; a cut goes back to the record companies. Of the ways music is consumed today, spending on subscription-based streaming ("renting" music rather than "owning" it) is a fraction of what spending on digital purchases on stores like Amazon (AMZN) or Apple's (AAPL) iTunes store can reach. Fewer people subscribe, and of those, the spending per month is generally lower. Even so, major music labels have found that there is money to be made via streaming music services. The Warner Music Group, which, sources say, has partnered with YouTube and Google on the new ventures, receives about 25% of its digital revenue from streaming last year, according to its quarterly reports. Record companies aren't in perfect agreement as to how much of their content to give away and are still hashing out what aspects of the user experience will be free on YouTube's new service, particularly when accessed from mobile devices. There is concern that under a "freemium" model, listeners might get used to not paying for music (again) and that revenue would be tied to the ad-sales that subsidize the free content. Sources in the record industry told Fortune that it is not yet clear if a subscription-based model is more lucrative (and therefore preferable) to an ad-subsidized approach. Free nets more customers, but the subscription model has consumers actively paying for music—a good thing, if you're in the music business, which just posted its first year on year increase in sales in thirteen years. If ever there was a company that could experiment with subscription versus ad-based models, it is Google. The power and size of YouTube's music audience is vast, and growing, and likely presents an opportunity too good for the record companies to pass up. Most of the website's top viewed videos are music, and the viewers of those videos represent a demographic that the record industry has always coveted: teens. Most tellingly, according to a Nielsen "Music 360" report from 2012, a startling 64% of teenagers prefer YouTube over any other music listening and discovery engine. Last month, when Billboard began incorporating YouTube views into its metrics, the artist Baauer and his viral sensation, "Harlem Shake," went shooting to the number one spot on Billboard's pop list. Indeed, most mega-hits of the last few years have been popular on YouTube, first, including "Call me Maybe" (418 million views) to "Gangnam Style" (1.38 billion views) to Gotye's Grammy-winning "Somebody That I Used to Know" (380 million views). This isn't YouTube's first dance with the record industry. The two have a joint venture, a hugely popular music video channel called Vevo. Content ID is another notable partnership: a bit of backend software YouTube runs to match videos with their "audio fingerprints," then tags uploaded videos and ensures royalties go to the copyright holders. The software allows owners of media to profit from what was, previously, copyright infringement. PSY, the South Korean pop-star behind "Gangnam Style," stands to earn about $2 million from YouTube for ad sales paired to audio fingerprints. Potentially foreshadowing how Google's two separate music services will compliment one another, YouTube has already begun embedding click to buy links on user-uploaded songs that direct to Google Play (along with Google's competitors: Amazon Mp3 and iTunes). It's not difficult to imagine a user's "collection" becoming jointly visible between the two platforms, or having music purchases or listening histories from one feed informing the recommendation engine of the other. Google is entering an already crowded field: Spotify, Pandora (P), Rdio, Soundcloud, and Muve Music all offer customers similar access to large online music libraries. Apple is rumored to be building a "radio" feature in its iTunes program that would deliver streaming music based upon a user's tastes—a service something like Pandora—that further merges the experience of being in a "store" to purchase music, and then listening to it in a "player." Beats By Dre, the headphone and speaker company, recently announced that it, too, would launch a streaming music serviced. It will be named Daisy—a reference to the first song "sung" by a computer. They're all fighting over a still small pie. U.S. consumers have been fairly slow to join—and stick with—subscription music services. The most popular, Muve Music, has just 1.4 million customers. (Spotify is close behind, with about 1 million.) It's success is in large part due to the fact that it bundles its price into a cellphone bill, as if it were a cable operator charging for an MTV/VH1 package. The mobile carrier that owns Muve, Cricket, is then able to sell subscriptions at less than $5 a month, far lower rates than Spotify, which generally costs about twice that much. Soundcloud, a free music streaming site that is user-curated and is, in many ways, similar in spirit and practice to YouTube, has recently begun partnering with major artists and large companies, such as Snoop Lion (nee, Dog) and Red Bull. Soundcloud boasts that it is the fastest growing music streaming site, with its users uploading about 10 hours of content a minute. In 2010, YouTube users uploaded 35 hours of content per minute; in 2011, they posted 48 hours per minute; as of last May, it was up to 72 hours a minute. It's not all music, but a lot is.